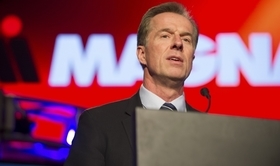 DETROIT — Don Walker, CEO of Magna International, Canada's largest supplier, urged automakers to slow investments in electric vehicles and form partnerships to help keep cars affordable. Walker, speaking last week at the Automotive News World Congress, said automakers have raised estimated spending on developing electrified vehicles over the next decade from $90 billion to $300 billion (all figures in USD). "We have to reduce the amount of money everybody's pouring in, because the end consumer basically wants cheap transportation," he said. Two estimates, one from TrueCar and the other from Cox Automotive, show average transaction prices for new vehicles in the United States alone topped $35,000 in December — up nearly $6,000 in just five years. Walker, in a wide-ranging speech, also touched on the possibility of expanding the company's successful contract manufacturing business to North America. Magna Steyr, a unit in Graz, Austria, currently builds vehicles for Jaguar, BMW, Toyota and others. Walker said that if his company were able to secure multiple deals with manufacturers to build between 20,000 and 50,000 vehicles each per year, it might take a look at General Motors' Oshawa plant, now slated to end production by the end of the year, or a brand-new plant as a North American venue for contract manufacturing. On paper, Oshawa looks like an ideal venue for contract assembly. A decade ago, GM spent nearly $2 billion converting the plant to flexible manufacturing. Oshawa's newly renovated paint shop can accommodate 27 body styles of cars, pickups and vans. One vehicle that may be a candidate for contract manufacture is the Cadillac CT6. GM said last week that it's not discontinuing the car for the U.S. but is looking for an alternative production site. GM currently builds the CT6 at Detroit-Hamtramck Assembly, which also is set to be idled, and at a plant in China.